Faculty, staff and students of the University of Limerick are being encouraged to pick up a book, fire up their kindles and settle down into their favourite reading nook to enjoy Donal Ryan’s The Spinning Heart, winner of the Bord Gáis Energy Book of the Year 2012 and the Sunday Independent Newcomer of the Year, and longlisted for the 2013 Man Booker Prize. Led by the Regional Writing Centre, under the guidance of the Centre for Teaching and Learning, the University of Limerick greeted October with the first iteration of its new UL One Campus, One Book initiative aimed at literally getting the whole UL campus community reading from the same book. The initiative is encouraging all members of the campus community to read the selected book and to talk to each other about it, whilst enjoying a number of events which will take place on campus over the course of the academic year based around The Spinning Heart. 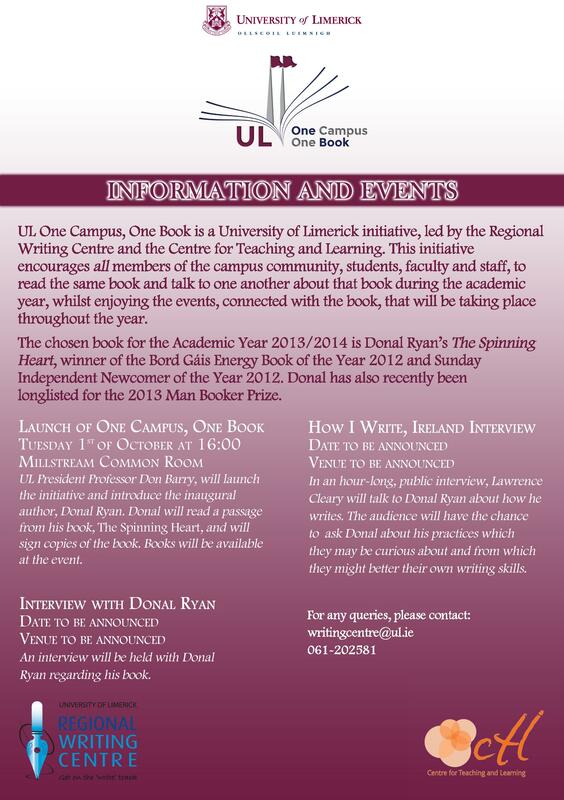 One Campus One Book was launched recently with a reading of a selection from the book by its author, a UL alumnus and long-time resident of Limerick Donal Ryan. Professor Sarah Moore, Associate Vice President Academic, referred to the initiative as “the beginning of something very special”, highlighting the importance of the initiative: “In order to be educated, responsible citizens we need good judgement, compassion and sensitivity, and you can’t have those things without imagination. What better way to nourish the imagination than through reading wonderful novels which allow us to get inside the heads of people whose lives we might otherwise not be able to understand. 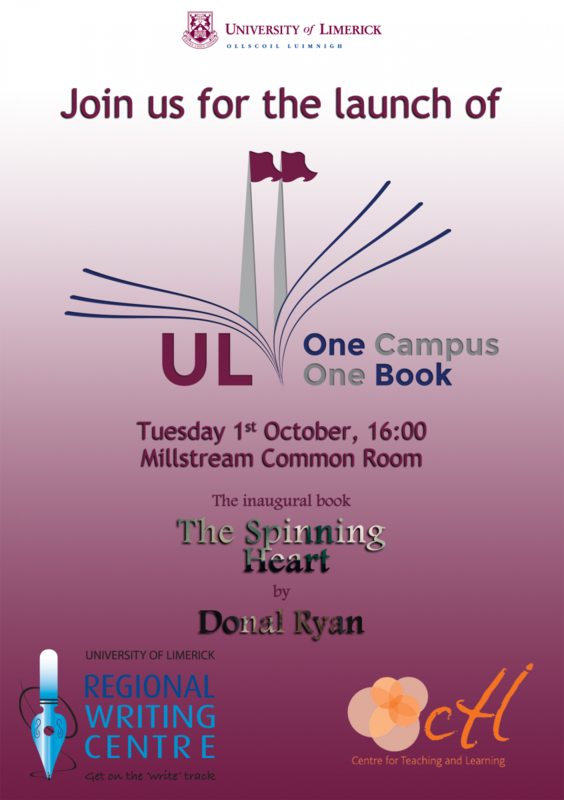 As Martha Nussbaum, distinguished professor of law and ethics at the University of Chicago has famously said: ‘An appropriate civic education must foster the capacity to understand people who may act from very different understandings, motives and capacities’ Donal Ryan’s wonderful novel, The Spinning Heart, is a perfect choice as the inaugural selection for One Campus One Book. It perceptively allows us to see the world from the perspectives of many different people, but it focuses on themes that unite us all, and will resonate with us in all sorts of ways. 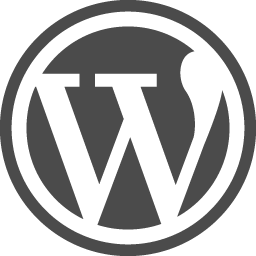 I hope it gives rise to a diversity of interesting conversations”. 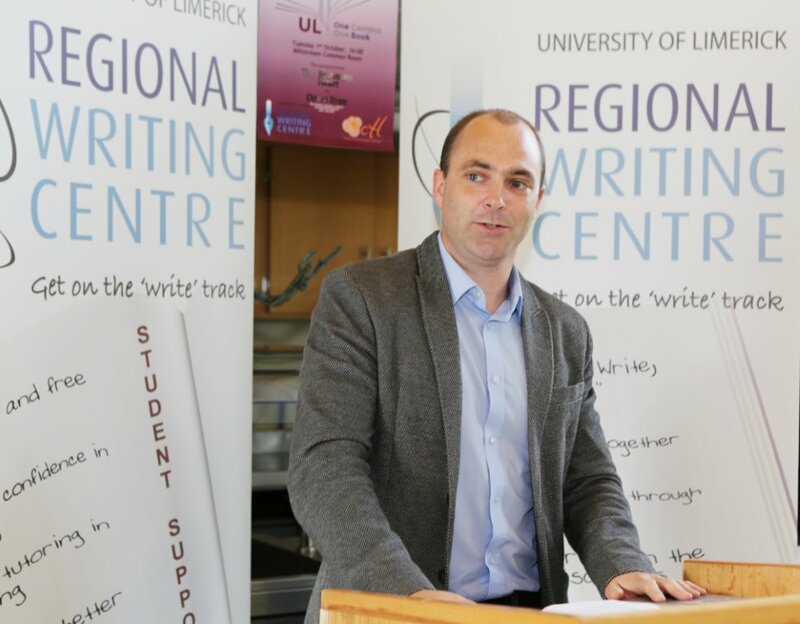 “Formal or informal”, says Lawrence Cleary, Writing Consultant for the Regional Writing Centre at UL, “programmes such as the UL One Campus, One Book initiative promote a sense of community, promotes literacy, learning and intellectual engagement across disciplinary divides. We hope that Donal Ryan’s The Spinning Heart will become a common ground for individuals across every strata of the university population and of the greater community, a common experience that not everyone will have experienced in the same way”.